Thousands of people descended upon Washington, D.C., today for protests on the anniversary of the violent Charlottesville rally, but only a few dozen appeared to be in support of the Unite the Right protest. The build up ahead of the planned protest appears to have led to the counter-protesters far outnumbering those who came to protest in support of white civil rights. The afternoon of protests started around the Foggy Bottom metro station, where many rode in from further afield. From there, large groups of police surrounded the handful of Unite the Right supporters as they headed towards Lafayette Park. 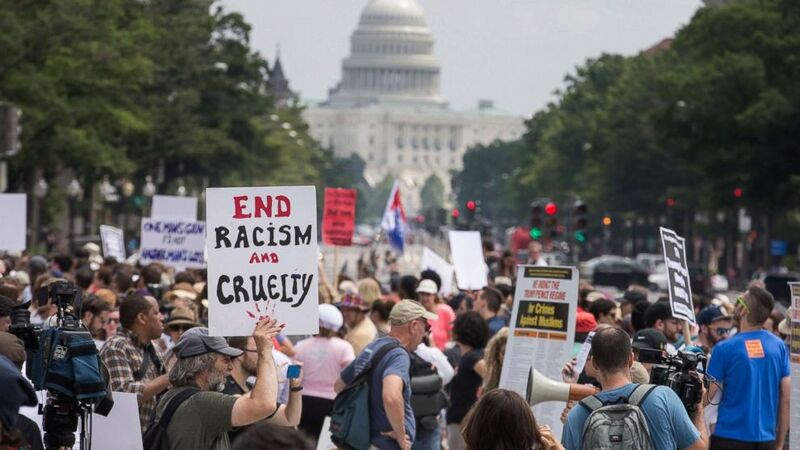 Crowds of counter-protesters who had also been permitted to hold a rally in Lafayette Park, directly outside the White House gates, beat the white supremacists to the park. Brendan Timmons was one of the people who showed up to send a message of tolerance amid the tense racial rhetoric. "One of the things that I've learned is that these white supremacists, these Nazis, they really believe that not only are they right but that most white people agree with them and so it was really important for me as a white person to show up and say 'No, that's wrong... your views are not acceptable in the mainstream, in mainstream society,'" he told ABC News. Timmons attended the counter protest along with his wife and their young son. "It's really important for us that we raise him to be an anti-racist white person and to stand up for oppressed minorities," Timmons said. Kate Robinson was another counter-protester, who came holding a sign that said that her grandfather fought in World War II. "It's important that they remember, people remember that this happened, we fought for our freedom against these kinds of ideals before to keep them out of this country before and now that [they're] back, we have to make sure that we don't let this happen," Robinson said. Sunday's protests and counter protests come on the one-year anniversary of a violent rally in Charlottesville, Virginia, where the Unite the Right group gathered to protest the planned removal of the statue of Confederate Gen. Robert E. Lee. A number of neo-Nazi and white supremacist groups were present in that August 2017 rally and it led to the death of one counter-protester, Heather Heyer, as well as two state troopers who died in a helicopter crash as they were headed to Charlottesville. Jason Kessler, the organizer of both this and last year's Unite the Right rally, started his remarks in D.C. by saying "I'm not doing this to disrespect the memory of the people who were hurt or died last year." He went on to thank law enforcement for protecting the various protest groups today, and said that he and his group have been targeted in the lead up to today's event. "I have people attacking me left, right and center," Kessler said. "Some of our speakers had their tires slashed on the way in," he said. Kessler said that he has never viewed himself as a white nationalist but said countries like the United States have been "flooded with too many people to the point where the host populations don't exist anymore." "I'm okay with sharing this country with people from around the world but if you bring in too many people at once it's not the same country anymore and that's what they're doing and that's why a lot of white people feel aggrieved. Because they feel like the country that they're waking up in in 2018 is a very, very different country than they woke up in 1960, 1970, 1980," Kessler said. One person who was not disturbed by the noisy gathering in Lafayette Square was President Donald Trump, who was not in the White House but at his golf course in Bedminister, New Jersey, instead. On Saturday, the day before the protests, Trump took to Twitter to denounce the deadly protests that took place in Charlottesville last year. He tweeted, "The riots in Charlottesville a year ago resulted in senseless death and division. We must come together as a nation. I condemn all types of racism and acts of violence. Peace to ALL Americans! Despite a heavy police presence in D.C., there have yet to be any reported arrests during the protests. There have been four arrests in Charlottesville, however, varying in charges from obstruction of free passage to disorderly conduct and one charge of assault and battery, a police press release stated. There were several memorials planned in Charlottesville and the governor issued a state of emergency declaration earlier in the week in preparation for protests on the anniversary.